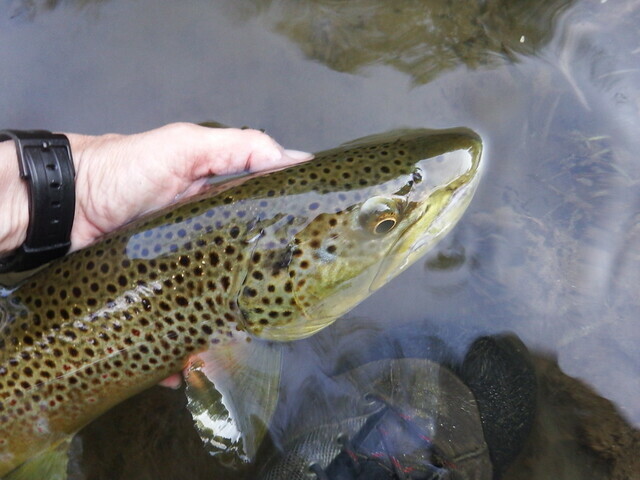 The Gunpowder River is clear, low at 46 CFs and 52 degrees F. Hendricksons are still about and caddis and a few sulphurs are just starting to show. Patterns to pick up in the muffin tins include #18-22 X-Caddis, Hendricksons in the #14-16 range , #14 Red Quill spinners and sulphur wets in a #16 to #18. Long leaders 10 to 12 feet in the 6x and 7x range will go along way in tricking wild fish. With most of the River in the shin deep to the knee deep range try to limit your wading. The trees have finally leafed out so seek out shaded banks to find fish tight up against woody debris mid-stream. With warmer days ahead, stop in the shop and pick up a pair of hippies to stay dry and cool. 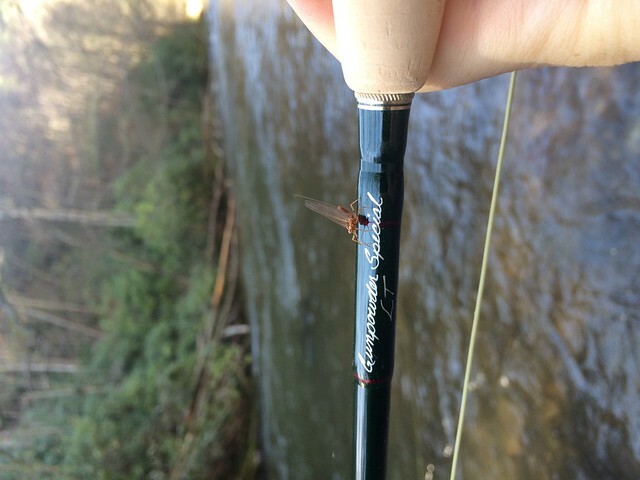 Thanks to Guide Kiki Galvan for the great photo and stream report –proof positive that small flies result in beautiful fish on the Gunpowder River. I was up fishing the Gunpowder on Friday and look what came to the net! It was around 7 pm when I was walking down river and throwing a x-caddis. The only way the fish would hit was to skitter it across current because the whole day the only action I saw was all the egg laying caddis that were hatching. I saw a few Sulphurs and no Hendricksons. Water levels were a bit low and the diddymo is horrible! A solid 18+ Caught it on my 4wt rod and 6x tippet! This entry was posted in fishing report on May 15, 2015 by Theaux Le Gardeur. and hours on Monday the 11th of May will be 12 PM to 5 PM. This entry was posted in news on May 8, 2015 by Theaux Le Gardeur. Thanks to Tim Wheeler of the Baltimore Sun for covering the recent Baltimore County Circuit Court decision from Judge Justin King to remand the Maryland Department of the Environment (MDE) Wetlands and Waterways Permit for the Columbia/NiSource line-mb extension project. Despite an 8,915 page record of decision that MDE provided the court to defend the permit, the court’s memorandum and opinion was critical of the permit on several important grounds highlighted in the May 5, front page Sun article and the article was also featured on B’More Green blog titled; Court halts stream crossings by natural gas pipeline in Baltimore County . A Baltimore County judge stopped completion — at least temporarily — of a 21-mile natural gas pipeline through northern Baltimore and Harford counties, declaring that state regulators failed to do enough to protect environmentally sensitive waterways and historic properties in the controversial project’s path. Circuit Judge Justin J. King ordered the Maryland Department of the Environment to revise the permit it issued last year to Columbia Gas Transmission to lay a 26-inch pipeline from Owings Mills to Fallston. King said state regulators failed to spell out safeguards the company must follow in crossing rivers and streams, making it impossible to tell if the project meets state and federal water-quality regulations. The judge also said the state didn’t properly notify affected property owners or give them a chance to weigh in on the $180 million project. And he said the agency made only a cursory check for potential impacts to historic dwellings. The ruling issued late last week was hailed by environmentalists, who said regulators glossed over how the pipeline would affect the 81 rivers and streams it’s expected to traverse, many of them sources of the Baltimore region’s drinking water and some havens for pollution-sensitive trout. The company sued dozens of Baltimore and Harford county property owners last year, invoking eminent domain so it could do pipeline work on more than 400 acres after failing to reach agreements with the owners on access to their land and compensation for the disturbance. To date, the pipeline has been laid from Fallston to the eastern edge of Oregon Ridge Park near Shawan and Beaver Dam roads, LeGardeur said, with one of the most pristine streams in the state next to be crossed. Advocates for the 1,000-acre county park had complained that the pipeline will destroy a swath of mature forest, disrupt wildlife and possibly degrade a popular swimming lake. We cannot continue this challenging work without support from you. Please support Gunpowder Riverkeeper by joining the 501(c)(3) nonprofit with a tax-deductible charitable contribution! This entry was posted in news on May 7, 2015 by Theaux Le Gardeur. The Gunpowder River is clear, flowing at 75CFs and is 56F. Thanks to Mike Colegrove for this great shot of a Hendrickson on his “Gunpowder Special”-If you’re an early riser, Caddis in the #16-18 range are a safe bet-especially x-caddis. We’ve also been swinging unweighted pheasant tails in the #12-14 range. By Mid-morning we’ve been fishing light Hendricksons in either a #14 or #16. Switching over to the dark Hendricksons after lunch will keep you in the game. Try a rusty spinner through the late afternoon and into the evening. Shad are in the lower Gunpowder and Deer Creek ad we have lots of fly rod darts tied locally in Bel Air, MD from Eric Snyder in the muffin tins. This entry was posted in fishing report on May 2, 2015 by Theaux Le Gardeur.